A mid-century Modern home, designed by Neun Designers Pvt. 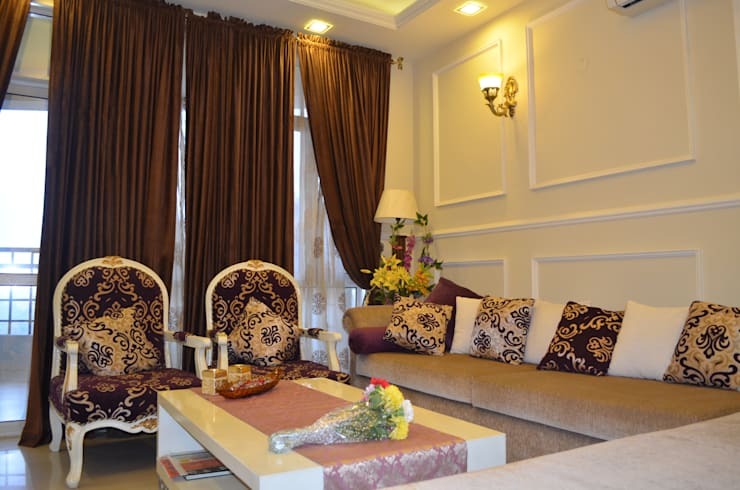 Ltd., Interior Designers and Decorators in New Delhi, is a wonderful way to incorporate different design ideas. A spacious living area, a dining arena, a regal passage, and two bedrooms are included in this gorgeous home. 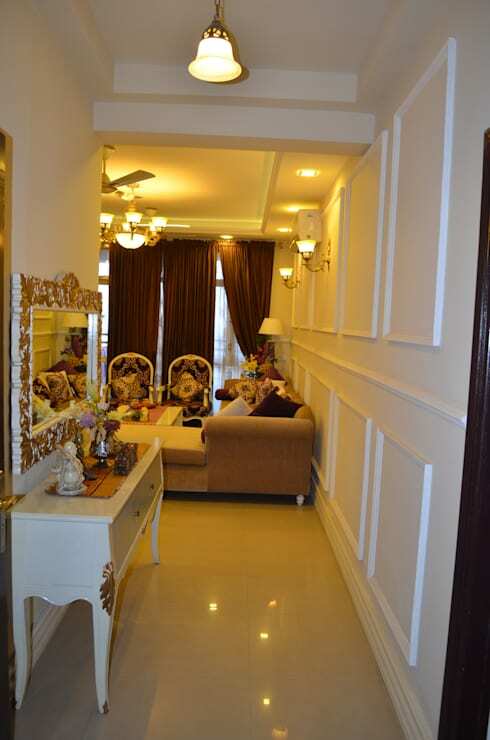 The home is set to give positive vibes with wonderful aesthetics. The overall modern look of the home is inviting, and the design is elegant and stylish. 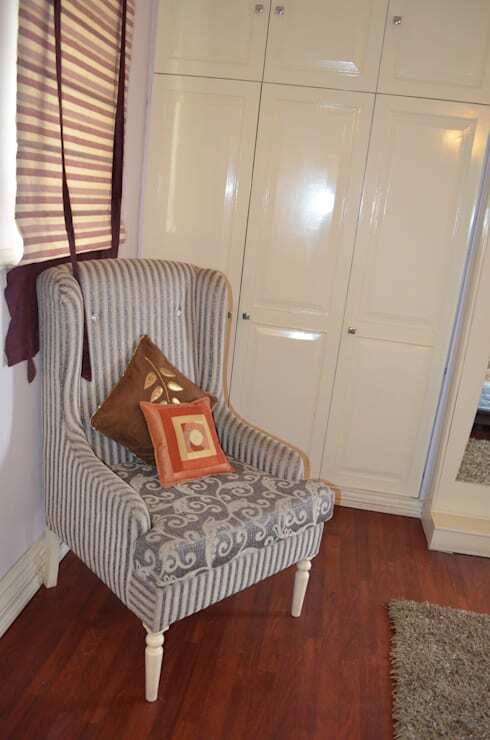 The wooden flooring is elegant and the white walls just add to the room’s sophisticated design. The window has been placed at an angle to offer optimal sunlight. The lounge area in the room has a comfortable armchair, with the window right behind it. 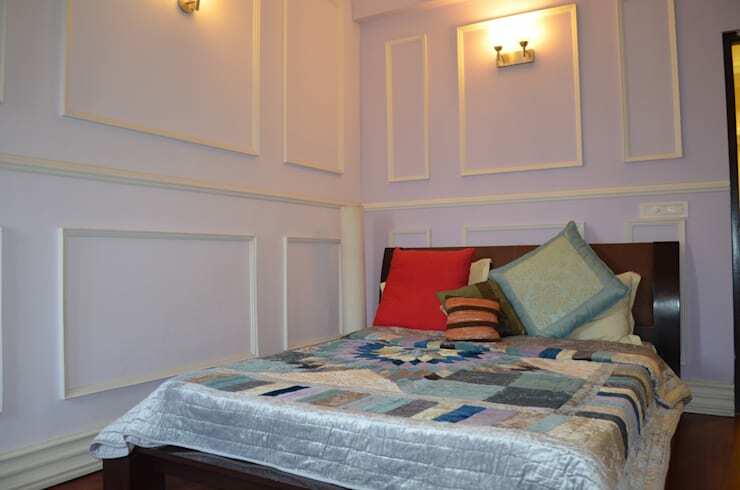 The wooden flooring makes it cosy and comfortable. The colourful cushions add a little panache to the room. An unusual piece of decor, this partial separator is an all-in-one décor element. 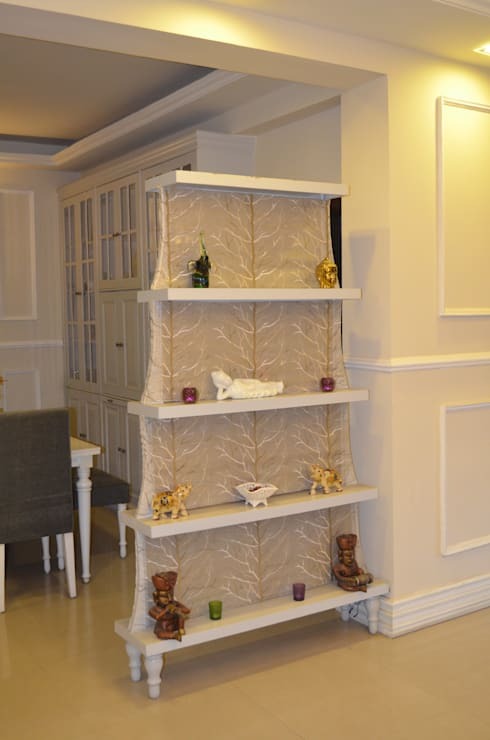 The angled shelves offer a space to display and showcase heirlooms or even family photos. The living area is designed to offer maximum space utilization, with a wide, open area. The expansive area has wonderful lighting, giving the room a beautiful glow with the overhead light fixtures. 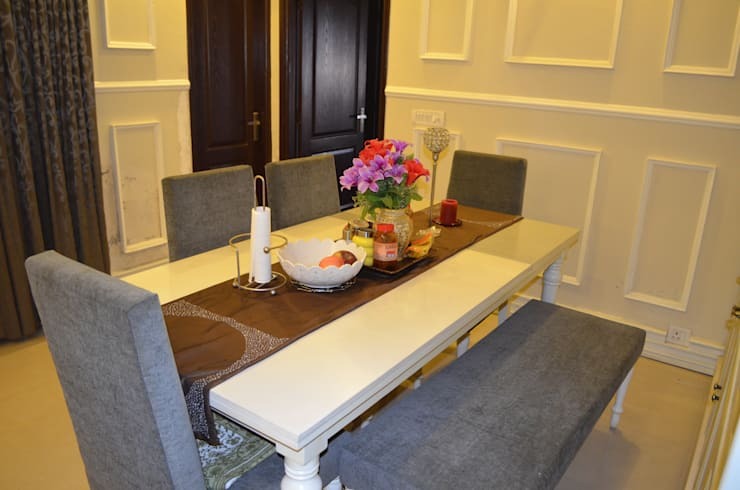 The dining area is well designed with a classy set of table and chairs. 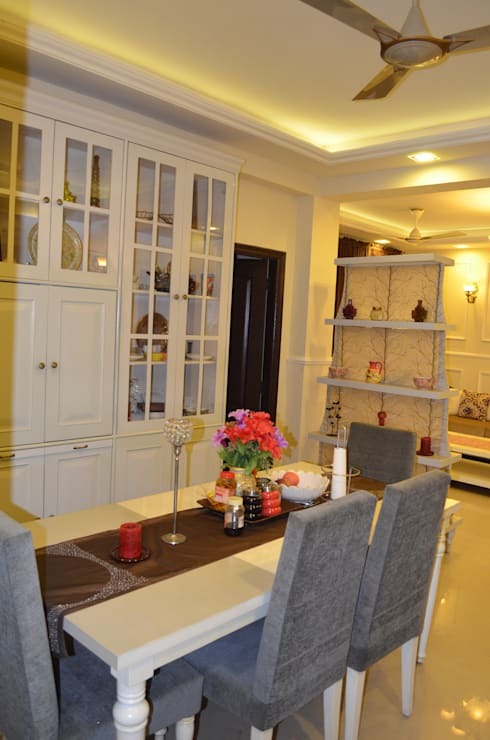 The cupboard adjacent to the dining area is the perfect place for storing special crockery. The elegant marble flooring is gorgeous. A brightly lit passage is a sign of a warm and inviting home. 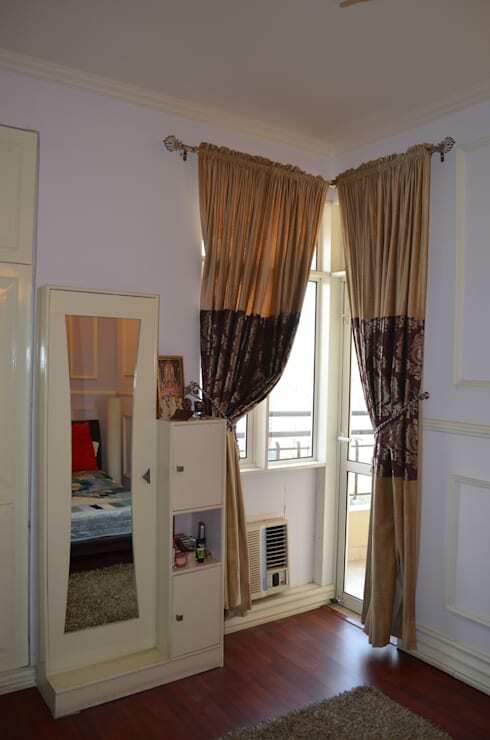 The dark coloured curtains hide a French window behind them. The side table with a flower vase and lamp are gorgeous additions to the décor. The TV set is designed unusually, unlike how normal TV walls are designed. The TV is placed on a shelf designed in the middle of the stylish white wardrobe unit. The backdrop for the TV is a stylish wooden panel. Unusual and unique, this yellow in the wall behind the bed is a bright pop of colour. 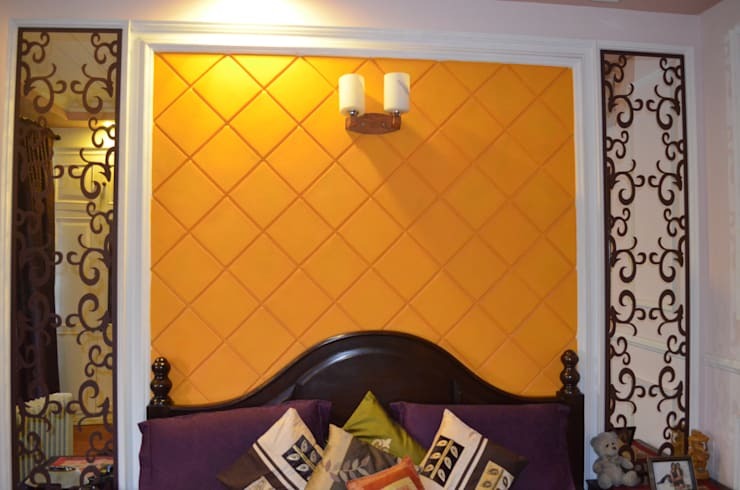 The unusual colour is flanked by two designer panels that add to the charm of the room’s décor and design. The upholstered dining chairs in grey suede add a touch of royalty to the dining space. The white textured walls add a unique character to this entire area. The dining table has a combination of chairs on one side and a picnic table style seating on the other side. Following the theme of minimalism, this bedroom is designed to keep everything subtle. The white walls, with the light hued linens and the soft lighting create a very relaxing space. The printed upholstery of the chair matches the throw pillows on the sofa and the rest of the neutral coloured furniture very well. 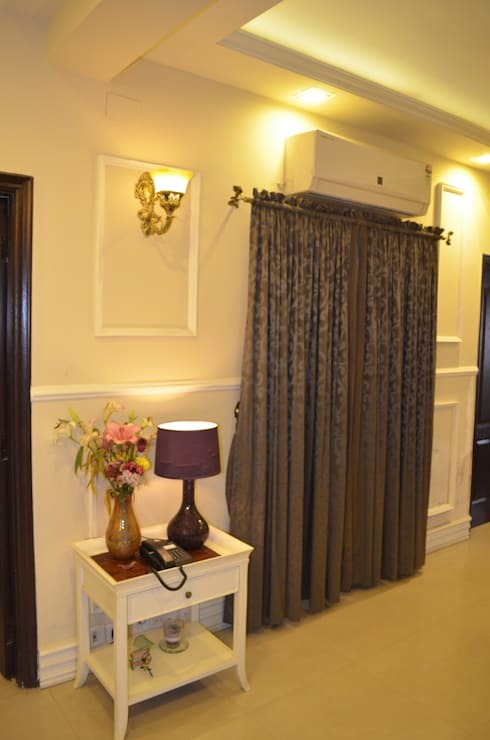 The dark coloured curtains and the white walls create the perfect design combination. This stunning corner in the house has a gilded mirror, enhanced by the soft lighting. 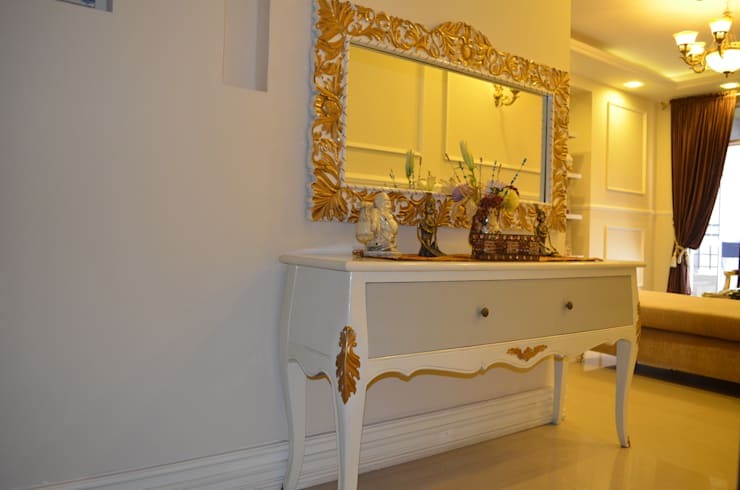 Right below the mirror is this vintage style dresser that holds some exquisite décor pieces. An eclectic three-bedroom home in Bengaluru.